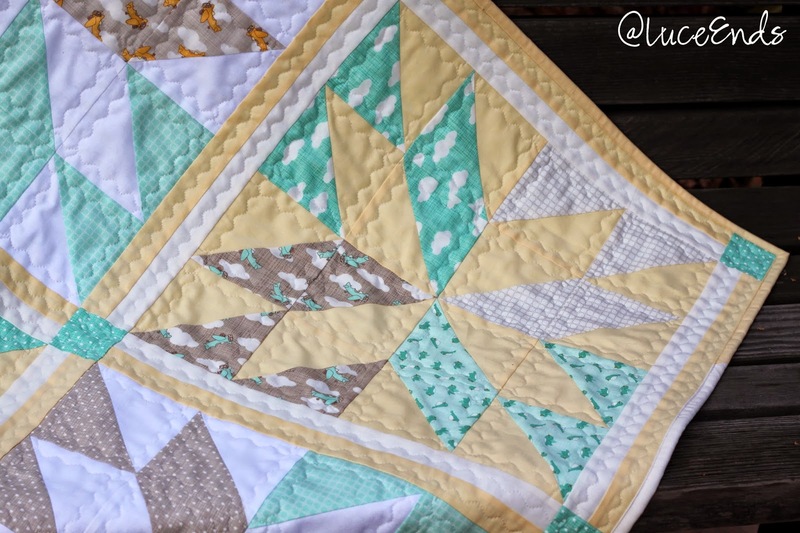 It's been a long time since I've worked on a quilt project, but a few weeks ago I had a bug to use up some of my quilt stuff. Here's the first completed project! 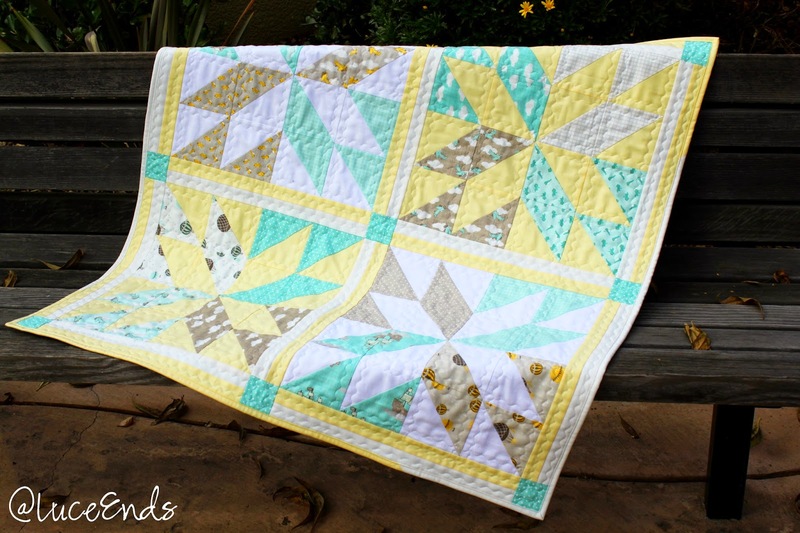 This quilt is a baby gift for a friend. I used a Thimble Blossoms pattern called Lucky. I think the Thimble Blossoms patterns are all so beautiful. Rather than making the full size, I made just 4 of the 16" blocks for this baby version. I used a few of the fabrics from a Kate and Birdie Storybook layer cake and some Moda solids. The back is pieced with some fabric remnants that match color-wise that had no other destination. 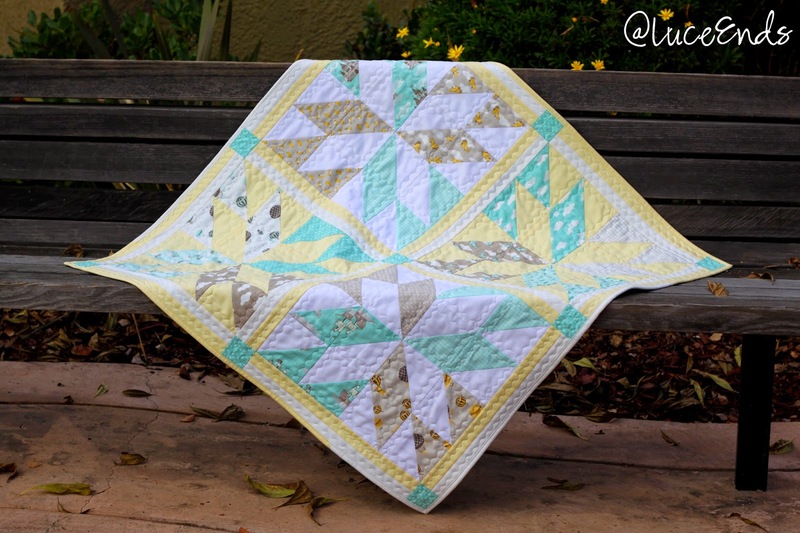 This is the first time I've had a quilt come together at the points easily. I'm not sure if the difference it the OLFA green cutting mat (rather than my pebbly blue Wal-Mart variety) I used or the 1/4" foot on my sewing machine. I hadn't used either before and am so happy with the result! I don't have a quilting function on my machine, so I just used a wavy stitch an either side of all the perpendicular seams. This binding is a new method for me as well, suggested by my mom. The binding is 2 3/8" wide, and sewn onto the back of the quilt, folded around to the front, and edge stitched on. It's quick and easy and looks good!